Party trays and dips go great at a party! There are endless recipes for party trays and dips that will turn an ordinary party into something sensational. Pick a few of your favorites and treat your guests to something delightful and delicious. Whether you are hosting a graduation party, birthday party or a small get-together with friends, a party tray and coordinating dip are great to serve to your guests. Not only are they simple to make, they are tasty and easy to have around at your next gathering. Many guests like to help themselves to food, so by offering food on a tray and a dip, they are able to pick what they like and enjoy. Depending on the number of guests you are planning on having, offer an assortment of the endless possible combinations. Try out some recipes for party trays and dips for your next party. One of the most popular party tray ideas is a cheese tray. Fill a platter or decorative tray with bite-sized cubes of cheese. Be sure to include a variety of cheeses such as hot pepper jack, Colby, sharp cheddar, swiss and a mild cheddar. A great garnish for the cheese tray would be grapes. Include a combination of meats and cheeses for your guests to enjoy. Include meats such as ham, turkey breast and roast beef. Cheeses to use can be swiss, pepper jack and cheddar cheese. You could either roll the meats and cheeses on the platter or lay them around the tray in an overlapping fashion. Another favorite is a vegetable tray. Arrange baby carrots, celery, broccoli, cauliflower, cucumbers, red and green bell peppers and cherry tomatoes on a large tray. To keep it light and simple, create a fresh fruit tray. On a platter, arrange whatever fruits are in season. Be sure to use a colorful mix of fruits. Some favorites to include are strawberries, blueberries, grapes, pineapple, kiwi and oranges. Combine all ingredients and mix until it becomes smooth and creamy. In a bowl, combine mayonnaise, sour cream, parmesan cheese and lemon juice. Next, stir in the artichoke hearts, spinach, garlic, pimiento, salt and pepper. Transfer mixture to an oven-safe dish and bake for 15 to 20 minutes at 350°. To finish, top with more parmesan cheese and serve. Combine dip mix with sour cream. Stir in the onions. Chill for at least 1 hour before serving. Get creative and serve your dips in a unique manner. One fun idea is to hollow out a red or green bell pepper and use it to hold the dip. A hollowed loaf of bread also works well. Be sure to add some decorative garnishes to your party trays. For instance, a bunch of grapes can add a pop of color to a cheese tray. Use big, leafy green lettuce as a bed for your meats or cheeses. If you are short on time, don't hesitate to use a store-bought dip. There is a wide variety of options available. 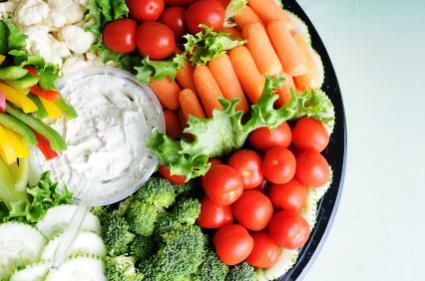 Try salsa, ranch dressing or a premade dip to compliment your party tray. Be sure to use a good quality brand that will satisfy both you and your guests.